normal functioning. It ensures that the results of successful change programs persist over time. term results it produces. Two key aspects of effective evaluation are measurement and research design. institutionalization of OD interventions in organizations. evaluation would involve assessing whether these positive results indeed did occur. about organizations, but they typically offer only broad prescriptions for how such changes are to occur. For example, job enrichment calls for adding discretion, variety, and meaningful feedback to people's jobs. and after-implementation evaluation of whether they are producing expected results. 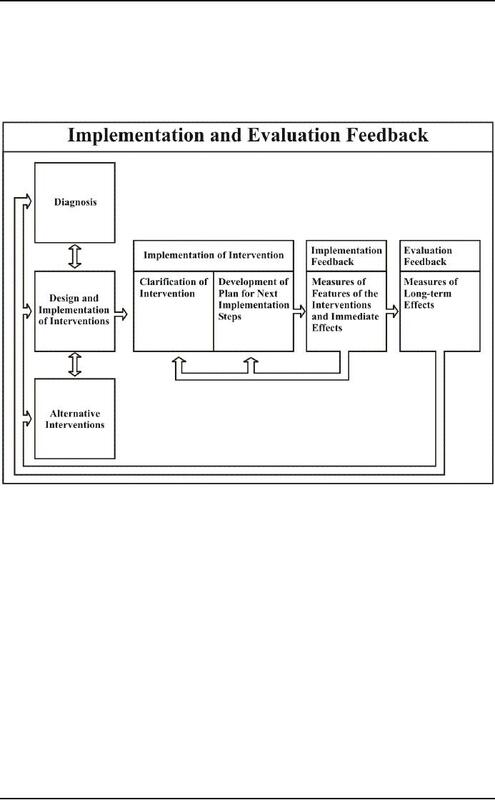 based on knowledge linking interventions to diagnosis and change management. repeatedly and at short intervals, provide a series of snapshots about how the intervention is progressing. members with knowledge about the intervention and ideas lot the next stage of implementation. interventions. Evaluation feedback takes longer to gather and interpret than does implementation feedback. changes, making them a permanent part of the organizations normal functioning. particularly suited to this situation. supervisors about their leadership styles. feedback is used to assess the overall effectiveness of the program. expected effects and thus should be continued and made more permanent. variables and designing good measures. books in the Wiley Series on Organizational Assessment and Change. develop a standardized set of behavioral outcomes for assessing and comparing intervention results.